Spare You The Details?... Me? limey green with nice moderate pastel opalescence. A nice medium weight louche that takes its time to unfold. A clear green line is established at about 2:1. Final coloration is as described above... reminds me of the Mansinthe louche. Very pretty but the influence of the blue and the distinct pastels make it seem just a little synthetic. Unlouched, anise, herbs, vanilla, graham cracker, honey. Louched, nice bright dusty herbs and flowers amply backed by the anise and fennel. A little lemony. It also has a rooty/earthy element (I'm thinking angelica) that adds some real gravity. Wormwood is present, neither dominant nor submissive. Like the other Matter Brevans, the pontica is the most prevalent coloring herb on the nose, but it is much better mannered than in the Giger due to the balances of the other elements present. I must say, really quite a successful schnoz. A nice smooth mid-weight on entry. Bright like the nose, anise, fennel, some lemon and spicy coriander keeping the treble turned up. Wormwood and the earthy element fill in the bottom end making this quite impressive. The palate doesn't enjoy the myriad distinct details of the nose, but it is very nice indeed. Initial finish is dominated by the pontica and a little burst of spice which then recedes. The trinity lingers nicely and as it slowly fades, the hyssop finally makes a clear appearance creating a moderate powderiness and pull. This all makes its impression for quite some time. Well, this is really quite nice, quality materials, balanced herb bill. Other than the now retired Marteau Verte Classique (which I had at 4.4), this scores as well as any other Matter absinthe I have reviewed (right with Duplais Balance and the also now retired Promethee, both of which I had at 4.2). I like it best right around 5:1 since it's got the stuffing to carry it at that dilution. The bottle reviewed is production from August, 2009. Being the geek I am, I'm always reading about this stuff including other folks reviews. And I can recall Andrew's summation that while very nice, this offering doesn't quite live up to its namesake. I couldn't agree more wholeheartedly. And believe me, I would never ding a review just because the absinthe is misnamed. That being said, however, this A.O. Spare is more content than capricious, pleasant than pioneering, and safe than salient. It would have been nice, considering the name, to see something a little more adventurous and groundbreaking. Done with a 1 ounce dose, diluted 4.5:1, 5:1 and no sugar. 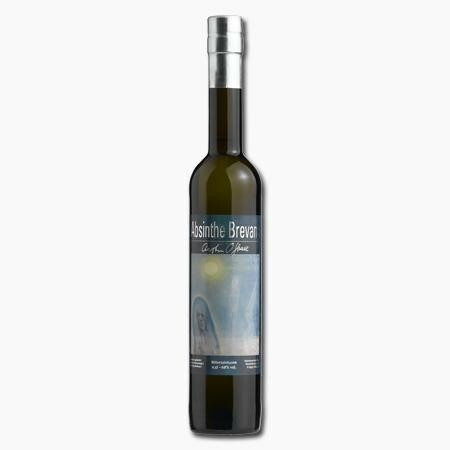 Absinthe Brevans A.O. Spare, 08/18/12, 9/06/12, 9/08/12, 9/28/12. Before water the absinthe is a vibrant, mossy green. Foresty. The aroma is rounded, honeyed. Anise is the only discernable herb. Purfumey. The louche is a tad tin but nice. It ends a pale, opalescent sea green. With water the aroma becomes much more anise-heavy, but still has notes of honey. Not much wormwood. The flavour is smooth and balanced, very sweet. Finally on the palate there's a good wormwood presence. Earthy with a cedar note or two, perhaps some powder. Not very complex but tasty. The finish is long and sweet, but lacks complexity. A bit candyish. I think there's room for improvement but it's a very enjoyable, albeit dark, absinthe. I did expect something a bit more idiosyncratic and adventurous based on its namesake but it's quite good anyway. Color: The clarity is exemplary with a natural peridot green. Textbook presentation here! Louche: Active swirls that melt into clouds with some nice layering when the louche nears completion. Thick but translucent when complete. Again this is textbook. Aroma: The absinthe trio is right up front with complexity in the back. Some vanilla and a little spicyness. Nice and strong but not overpowering. Flavor: The flavor starts out crisp light and sweet. The layers display some here and there but not much with a traditional absinthe flavor dominating. A little too weak and light for my taste but still very well done. Finish: The finish warms up immediately and lasts a good while with a bitter pop at the end. It starts sweet and spicy and ends smooth and bitter. Cool almost â€œtwo stageâ€ effect. Overall: Amazing presentation with the color, louche, and aroma. The taste is good but a little weak for me and the finish is a nice two step gradient. Needs to work on the strength of the flavor and it could easily start competing with my favorites. Color: An amazing bright green that is exactly what comes to mind when I think of absinthe green. Louche: Really beautiful louche, starting with turbulent, spinning oils, showing some amber, and bluish clouds, ending in a very pleasant, slightly translucent pale green with red and orange flashes. Aroma: There is some vanilla when neat but not so much of a presence when louched. There's a great balance between the trinity, along with some nice melissa backing. Fairly sweet. Flavor: I was afraid it would be too warm based off of the smell, but it's much more of a "cold" flavor. The flavor that's present is good, but not as pronounced as I would like. The same flavor, but bolder, would be ideal. Finish: The finish is great: yummy and warm and very numb and tingly. Very refreshing. Overall: This absinthe is great. If only the flavor was a tad stronger, it would be perfect. Louche- Slow transition with a defined meniscus. Green blue refractions under natural sunlight. The louche might be a tad too thick at the end. Aroma- Anise with a carmely/powdery smell. Certainly reminds me of some Jade products. Well balanced and savory. Flavor- Comingling of sweet anise and wormwood is perfect . Powdery hyssop mixes with the carmel flavors and herbaceous notes and is unique. I would rate the taste as more robust than fresh. Very complex and enjoyable. Finish- Wormwood and hyssop leads into anise. Medium lasting but complex while it lasts. Overall- A fine addition to the Matter line up of absinthes. AO Spare reminds me of a Jade in a lot of ways but is definitely unique in the combination of flavors. Well done. Color: Nice natural emerald green. Louche: Slow steady build with nice clouds and layering, nicely opalescent. Great color. Aroma: Wormwood and floral elements reach out and grab you. An inviting aroma right out of the bottle. Fresh and clean. Flavor: Wormwood forward, with anise just behind. Well-balanced. At the edges, there is light mint, fresh florals, pepper and light citrus. A light, refined bitterness, clean and sharp. At 4:1 where it is still rich and thick, there is a bit more numbing than I'd prefer. A very different profile from the other absinthes I've tried from Oliver Matter. Finish: It follows the flavor, with edges of pepper and citrus. A fresh herbal build that fades nicely to a powdery feeling on the tongue. Overall: A clean, refreshing absinthe. Very tasty and high quality. Perhaps Matter's best verte. I have had the opportunity of tasting 1st batch of that absinthe as well as the newest one that is not for sale so far. Aroma is superb with very strong pontica, wormwood notes, some coriander with aniseed swirling around. Flavour is bold, pontica goodness at its best, not heavy on the palate, refreshing and crisp. Finish is long with well-placed wormwood. I really liked it. Although from the label and aura that surrounds it, it might have ended like Mansinthe or Duplais Balance, this one is a good, even very good, nicely-crafted traditional absinthe. Good work, Oliver!